Lamar Jackson’s Ravens saw their season end on Sunday with a 23-17 Wild Card home loss to the Chargers, in a game that was very much a learning experience for Jackson. Though a pair of touchdowns in the fourth quarter made the contest competitive, for the majority of the day Baltimore’s rookie quarterback looked nervous and limited by a fearsome L.A. front, which learned from its mistakes in a 22-10 loss to the Ravens two weeks ago. The Chargers managed to bring constant pressure and negate Jackson’s speed by loading the field with defensive backs, leading to seven sacks, three fumbles by Jackson, and a pick. In the third quarter, when even with great field position the Ravens couldn’t find the end zone, the boos from the Baltimore fans got real loud, and it seemed likely that longtime starter Joe Flacco—who lost his first-string slot to Jackson in Week 11—could find his way back onto the field. That never happened, and the Ravens’ decision to stick with their quarterback of the future probably paid off. Game-ending fumble aside, Jackson was able to salvage his day in the fourth with a couple of touchdown drives, which at the very least provided the young guy with some confidence going forward and headed off too much of a postgame quarterback controversy. Flacco was never an incredible quarterback, but since he’s turned 30 his talents have taken a dip—in nine 2018 starts, he managed just 6.5 yards/attempt and 12 touchdowns. Still, consistent okay-ness at quarterback remains a need that a lot of teams desperately have to fill. 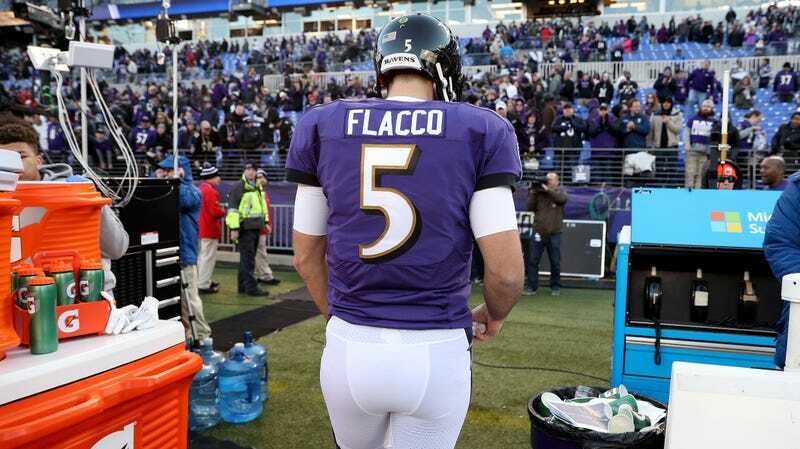 Flacco leaves the Ravens as a Super Bowl champion and, as Harbaugh notes, the best quarterback in franchise history by literally over a dozen miles. Washington, Denver, and Jacksonville, among others, could all be in the market for him as a starter.